I wanted to take more different pictures of this pizza with a more close up on a cut slice but unfortunately, my battery went off, so all I had time to take was a whole pizza uncut. Since everyone has been talking about this pizza from a friend in Island to another friend in Italy, I wanted to try it out for myself. 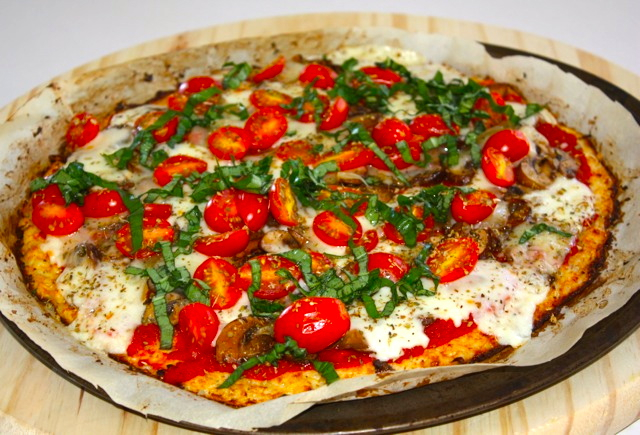 The particularity of this pizza is that the crust is made out of ground cauliflower, cheese and eggs, no flour. The first time I made it, the crust was a bit soft and soaked, due to the fact that I did not squeeze enough liquid from the cauliflower, but with a delicious flavor, so I wanted to make it right with a decent textured crust. The secret is to squeeze all water from the cauliflower after it’s been microwaved. I am used to Italian pizza, the way they’re served in Italy. Usually, they don’t put any garlic, or onions, the ingredients are simple and of good quality so I like to keep simple. 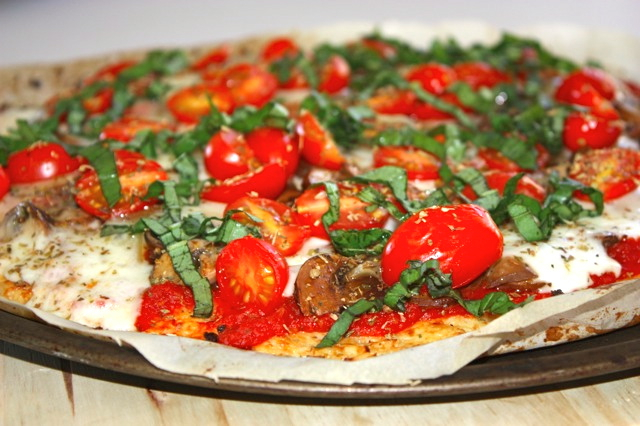 Of course, you can put any toppings of your choice, the focus of this pizza is primary its crust, not the toppings. For the tomato sauce, I like to use whole San Marzano tomatoes, that I crush in the mixer, make sure you don’t buy the kind with added basil or garlic, or onion. They tend to be acidic and with a strong unnatural flavor. I was skeptical at first, then after tasting it, I was amazed at the crust texture, it was so delicious that you forget that there is no dough…no flour, no yeast, just cauliflower. Now it’s an all time favorite in this house! Cook mushrooms in a little olive oil and salt, until water evaporates. Keep aside. Cook crushed tomatoes with a little salt in a pot until you obtain a thick sauce, with no water (about 10 minutes). Set those aside. Microwave ground cauliflower in a large container for about 8-10 minutes. Remove from microwave and let it cool. Place cauliflower in a cheese cloth or a large cotton towel and squeeze firmly until the water comes out. You need to remove the excess moisture from the cauliflower. In another container, mix cauliflower, cheeses, eggs and salt. Mix well until you obtain an homogeneous dough. Pre heat oven at 420F. 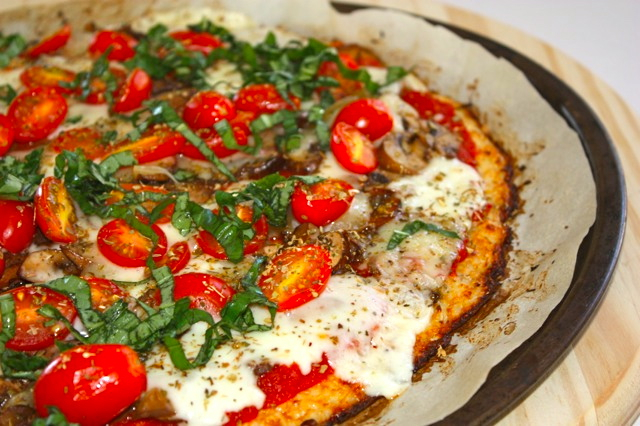 Cut parchment paper the size of your pizza pan. Spread the dough evenly on top of the parchment paper. The crust should be about 3-4 mm thick. Form a nice a smooth round circle with your dough. Place in the oven for about 15 minutes until the dough gets lightly golden. Remove from the oven and start adding the toppings. Spread tomato sauce first, then add mushrooms. The next layer is the cheese, place cheese slices evenly on top, add cherry tomatoes, and finish with oregano. This entry was posted by silvia on June 5, 2016 at 9:03 pm, and is filed under Vegetarian - dairy. Follow any responses to this post through RSS 2.0.You can leave a response or trackback from your own site.